Let me start by giving a reminder that I am a beginner knitter. I have no knowledge of knitting, no past experience knitting, and know nothing about it. Nada. Now, I do know what knitting needles look like, but that’s about it. Really. So, I start to read and try to understand the steps involved in order to Cast On. Of the six steps for Casting On, I did at least understand the first step. Step 1: Make a slip knot about four inches from the end of the yarn. Step 2: Insert right-hand needle through the slip knot and pass the yarn over the needle. Hmm. About that slip knot. As I hold the slip knot up to my face and look at it, I can’t help but wonder about orientation. Am I supposed to hold the slip knot in such a way that there is a front side and back side to it. And thus, I would have the two options of sticking the needle through the loop which would be from either the front of the loop to the back of the loop or the back of the loop to the front of the loop. Or, do I hold the loop in such a manner that when I look at it there is a right side and left side to the loop. And hence, I would be either sticking the needle in the loop from a left to right or right to left direction. With waning confidence, I hold the loop in such a manner that when I look at it, the loop has a right side and a left side. That seems to make the most sense to me. As instructed in step 2, I insert my right-hand needle through the slip knot and pass the yarn over the needle. Now on to the third step. At this point, my waning confidence abandoned me. I just didn’t get it. In step 1, I made a slip knot as instructed. 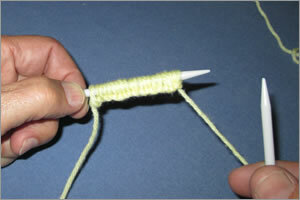 In step 2, I inserted my right-hand needle through the slip knot and passed the yarn over the needle as instructed. Now, how do I do the third step which simply says to pull through a loop? Do I stick my left needle through the loop of the slip knot and try to snag the yarn somehow so that I can pull a loop through? And why does the illustration in the book look so different than what I am seeing in my fingers? Noticing that I was not making much progress, my avid knitter wife asked if I needed any help. Though I hate to be so needy and dependent, I told her that I did and asked her if she would watch what I was doing and tell me where I was going wrong. She agreed and came over to stand behind me and watch the action. Step 1: I made a slip knot and held it up for my wife to see and approve. Step 2: I inserted my right-hand needle through the slip knot and passed the yarn over it as best I could. My wife immediately stopped me and asked me what I was doing. Sensing something wrong, I told her I was following the steps for Casting On. 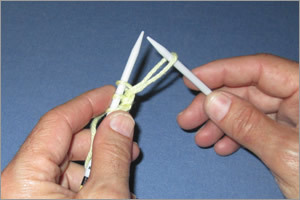 After my wife stopped laughing, she explained to me that after I make the slip knot, I am supposed to first put the loop of the slip knot on my left-hand needle before proceeding to step 2, which is to insert the right-hand needle through the loop also. And important to note, the right-hand needle goes under the left-hand needle, not above it. Then after that, I pass the yarn over the right-hand needle. And then I can do step 3, which is to pull a loop through. Now wait just a Jimmy Stewart minute. Is it me? Or, was there a boat-load of missing information and instructions that should have been in these first three steps? Turns out, after making the slip knot, you need to start with the loop on the left-hand needle and it does matter which end of the loop you stick the left-hand needle through. And it also matters how you stick the right-hand needle through the loop and its position, on top of or below, with respect to the left-hand needle. I suppose an experienced knitter would have no difficulty with these high-level instructions, but here again, I am a beginner and this Knitting Made Easy book posits itself as beginner basics. So my avid knitter wife tells me to put down the book and to watch her Cast On and to listen to her explain how to do it. A big part of me wanted to instead have a discussion with her about how difficult these knitting books are to read and understand, knowing full well that such a discussion would result in me being called obtuse, again. Alas, the other part of me thought it would be better to just do what my wife told me. So, I did. After her show and tell, my wife told me to Cast On twenty stitches and left me on my own to do just that. And here is what I came up with. Ever so proudly, I took my beautiful, tightly knitted Cast On to my wife for her inspection and grade. Before the words came out of her mouth, I could tell by the expression of disappointment on her face that I had failed. Again. Turns out. You are not suppose to Cast On so tightly. And furthermore, it is quite important to have the correct amount of tension when holding the yarn in your right hand. 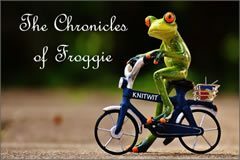 Too much tension makes the stitches too tight and it can be hard to find a loop to stick the needle through. Too little tension makes the stitches too loose and then yarn can easily fall off either needle. And having both, too tight and too loose tension, while you knit produces inconsistent looking stitches, the tell-tale sign of a beginner knitter. Here again, none of this was explained in the book. Just saying. I spent the rest of the night practicing and playing with my Cast On. I would Cast On ten stitches and then take the yarn off my needle, rip out my work, and do it all over again. As my wife watched Magnum PI and oohed and aahed over the new young star playing Magnum, Jay Hernandez, and compared his cuteness to that of the original Magnum, Tom Selleck, I oohed and aahed over my not too tight, not to loose, consistently stitched Cast On and compared how much better my last Cast On of the night was from my first. It was a good evening. I had an above average Cast On, my avid knitter wife had her Magnum fix, and we both went to bed with smiles on our faces.